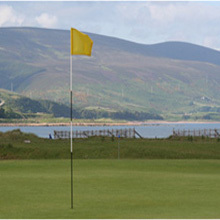 Brora is the most northenly golf memorial to James Braid in his native Scotland. It is also the headquarters of the James Braid Golfing Society, and while its president, Peter Thomson, and fellow member Ronan Rafferty annually enthuse, the club golfer, the bedrock of the game, will derive equal pleasure and satisfaction from Brora's 6110 yeards. Given 194 acres of Scottish links land to work on, what in 1923 was entitled "Braid's Plan" is hardly altered. Here the visitor will enjoy the mixture of bent grass and beach sand, burn water and gorse in glorious yellow May bloom. There is even a railway which come into play from the tenth tee.